DesignPile is one of the best blogger themes that I converted.This theme comes in 3 color styles.You can use this blog theme for any kind of blogs such as personal blog,girly blogs,design blogs etc. I like this theme and I’m going to use this for my blog it’s about 3d Movies. 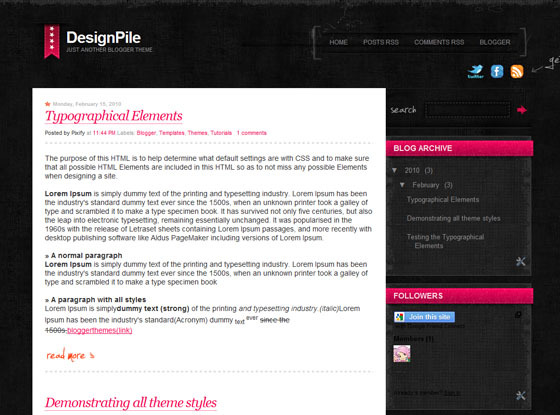 I have download designPile pink theme for my blog. I have a problem ….the color of text is black and is not visible. Please check this out in follower gadet. Hi I really love this template… how do you add the “read more” on this template? I`m working on using this template for my blog cand you please tell me how do I add links to the facebook and twitter icons? Or to add directly the “follow on twitter” or “add on facebook” links to them? Nice!!! wanted to try this theme on my blog but it has loads of bugs in IE6 . the png transparency is to be fixed. You might have to take a look at it.. I think that the blogger version is much better than the real one ! Hey Asker, I need help with the search button. I get an error on page. I tried during many hours to add the next and preevious button, but I still have no answers. I love this theme, I just have two questions: (1) how do I add the link for the search button; and (2) change the font color for Twitter Updates, Recent Posts. I thought blogger would have that option (like it does for the followers widget). hey I am using another version of this template (that isn’t displayed on this website anymore) but it was a few days ago… its called design pile, pink. I wanted to know if there’s a way to widen the middle area without making the sidebar disappear. I try to edit the pixels just a little (make the middle wider, the sidebar thinner) but then the sidebar disappears and the middle area just looks the same.